When it comes to tomatoes, the size of the plants tends to be vastly dissimilar among different varieties. Some tomato plants can grow up to 12 feet, while some grow as low as 8 inches only. Even the size and weight of fruits can vary a lot as well. Beefsteak tomatoes, for example, can have large 3-pound fruits. Meanwhile, cherry tomatoes may only have around 4-ounce fruits. In this post, we will focus on Currant tomatoes in details – from its plant to the fruits. So read on! 1 What is a Currant Tomato? What is a Currant Tomato? A Currant tomato is a variety of tomato which is often categorized as a cherry tomato. However, unlike other cherry tomatoes, Currant tomato fruits tend to be even smaller. The fruits of Currant tomatoes are very tiny and tend to grow in large clusters. There are many varieties of Currant tomatoes with different characteristics. The easiest difference to recognize is their colors. 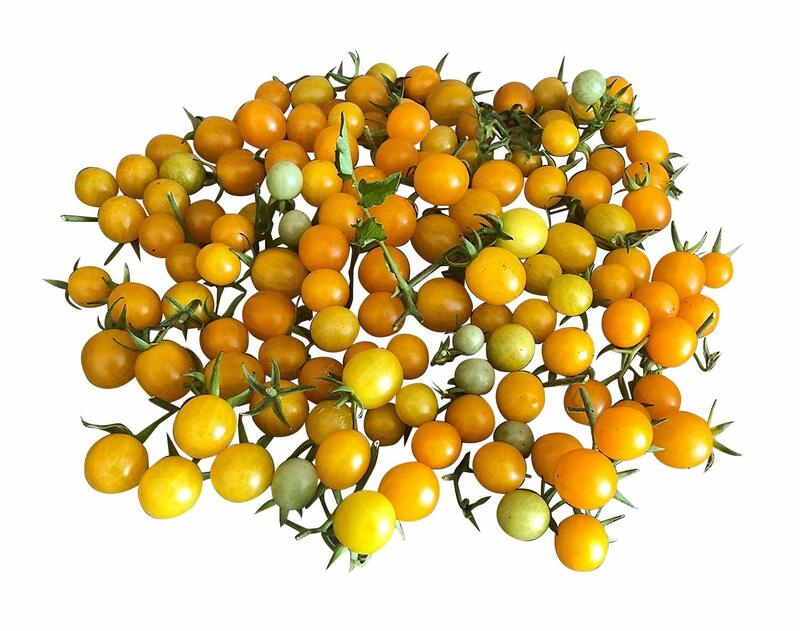 Most of the Currant tomatoes have red fruits, but some have yellow ones and even white ones. As mentioned before, the size of the plant and fruits can vary greatly among different varieties. Despite its small fruits, a Currant tomato plant can grow up to 8 feet tall. To put this into perspective, many cherry tomato plants can grow up to 4 feet only. Lastly, Currant tomato plants are indeterminate plants. Due to how their plant can grow tall, they require ample support and staking. You may be wondering why you should consider planting Currant tomatoes over any other varieties. Naturally, there are some advantages to planting Currant tomatoes. Here are some of them. Indeterminate heirloom plants are quite popular among backyard gardeners nowadays. As long as you put in your best efforts, the cost-yield efficiency of planting indeterminate heirloom tomatoes such as Currant tomatoes is remarkably high. First of all, indeterminate tomatoes do not die after the first harvest. They can keep growing fruits all throughout different seasons until winter. 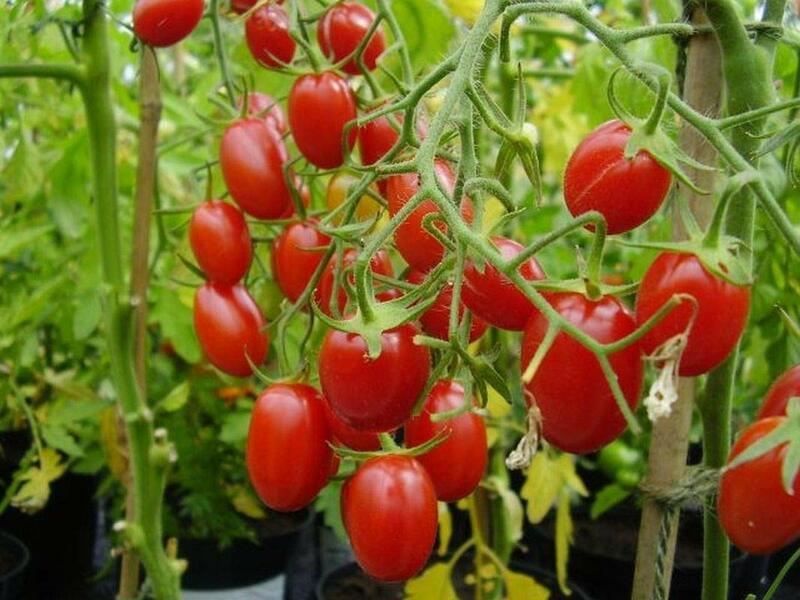 In a year, as long as your Currant tomatoes don’t die from diseases or malnutrition, you will not need to plant over and over again. Next, since most Currant tomatoes are heirloom tomatoes, you can harvest their seeds and plant them again for next year. Unlike seeds hybrid tomato fruits, harvested heirloom tomato seeds can be planted in your garden and you can expect them to be similar to their parent plant. One thing to note, however, is that some varieties of Currant tomatoes can be seedless or nearly seedless. It is only natural considering how tiny their fruits are. In this case, you may find it hard to harvest the seeds and you will still have to buy the seeds or seedlings for the next year. Currant tomato fruits are very tiny. In fact, their size is comparable to grapes or even sweet peas. Therefore, it is quite simple to pick some from the plant, wash them, and eat them as is. Even though Currant tomatoes are quite delicious on their own, this does not mean that they do not have other uses. Currant tomatoes are cherry tomatoes. Thus, you can treat them as such and use them in similar ways. Currant tomatoes can be used in salads and soups. A more unique use would be to process them into tomato raisins. As mentioned before, Currant tomatoes can come in different characteristics. This is especially true for their fruits’ taste and color. Red Currant tomatoes are tangy and juicy. If you want your typical tomato fruit to be compressed into bite-sized shapes, this is your best choice. Yellow Currant tomatoes, on the other hand, are sugary tomatoes. They are very sweet and delicious. If red Currant tomatoes are great fruits to chomp on as is, the yellow ones are even better for sweet tooths. Aside from the red and yellow ones, there are still many Currant tomato types and varieties that exist such as the white Currant tomato. It is up to you what to choose from them. As already mentioned, Currant tomatoes are indeterminate plants. Therefore, they will require caging and staking so that their vines and fruits will not touch the ground and rot. Fortunately, aside from this, Currant tomatoes are actually surprisingly easy to grow. This is due to their high natural resistance against diseases. As for their ideal conditions for growth, you can plant Currant tomatoes in areas with relatively high temperatures and they will still strive. Currant tomatoes largely prefer soil that does not hold too much water at once. We call this kind of soil ‘well-drained’. Non-well-drained soil can pool the water, making it moist all the time. This environment is not ideal for Currant tomato plants. 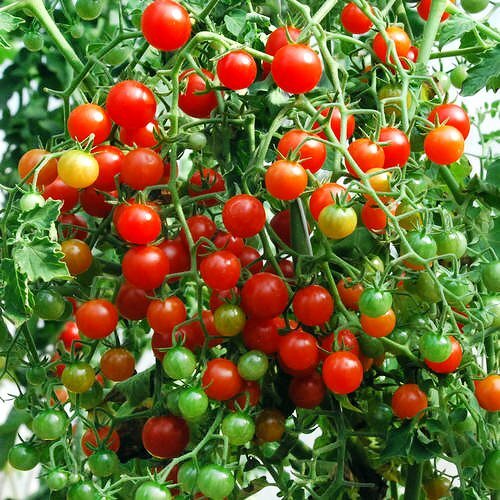 One thing you can do to make your Currant tomatoes grow healthier is to apply fertilizers. This is especially important once the plant starts to sprout a few leaves and when the plant starts to bear fruit. For more efficient use, the trick is to find the most appropriate fertilizer based on your soil and tomato. If you are interested in planting Currant tomatoes, you obviously would want to buy either seeds or seedlings. Seeds are more accessible, especially online. Thus, in this section, we recommend some of the seeds of the best Currant tomatoes in the market. The first one in this list is the seeds of the Sweet Pea Currant tomato seeds. The tomatoes of this variety are heirloom and they bear tiny red fruits. Even though Sweet Pea tomatoes are red in color, they are surprisingly sweet, as its name suggests. They grow in large clusters that net the gardener with large harvests. The seeds of the Sweet Pea tomato like moist soil. You should make sure they are watered properly. If you do set them up correctly, they can mature in around 60 days. The tomatoes of this variety are indeterminate plants. Fortunately, even without staking, you can still grow them by planting them in hanging baskets. As long as you are careful with the vines, there should be little problems. These plants are heirloom plants. You can take advantage of this fact. 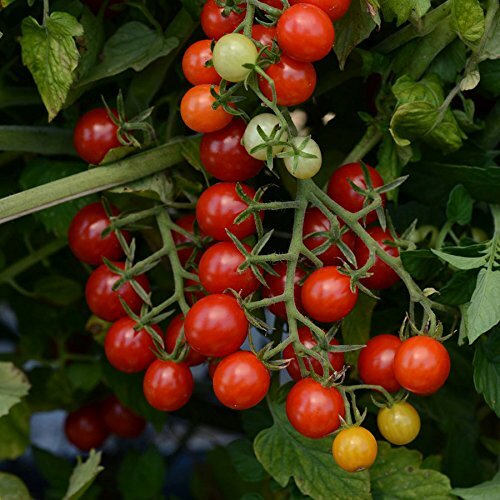 The Gold Rush tomato variety is unique among the Currant tomato varieties in this list. This is due to its color – golden yellow. As you may realize from the colors of the fruit of this heirloom tomato plant, they are quite sweet and refreshing. Because of their size and beautiful color, it is very tempting to pick them up even when they are not ripe. 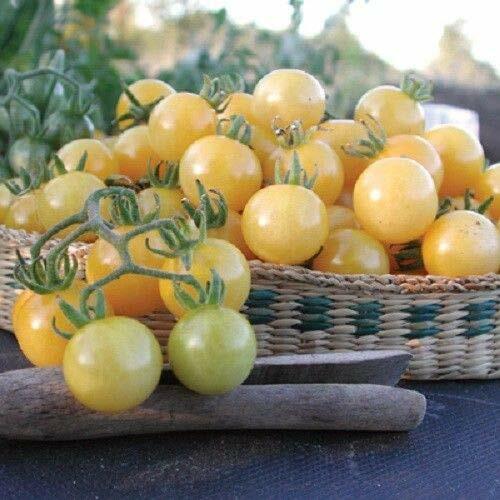 Speaking of their beautiful color, the Gold Rush tomatoes look absolutely gorgeous once these fruits grow. The plant of this variety can get extremely bushy, but once the fruits grow, the bushes can get covered by multiple yellow fruits that gleam in the sun. They are a natural decoration on their own. These yellow Currant tomatoes need staking to support them. You can also try and contain them if you don’t have enough space. However, this is very hard to do. Hence, it is recommended to set aside a large space for these tomatoes. Gold Rush tomatoes are indeterminate heirloom tomatoes. You can have very high yields with them, and they can continue producing all throughout the year. As its name implies, the fruits of the White Currant tomato plants are white. Well, not exactly. To be more accurate, they are actually pale-yellow. Speaking of their pale-yellow skins, tomatoes with fruits of this color tend to be very sweet. Naturally, the fruits of White Currant tomatoes are the same. White Currant tomatoes like to grow in colder climates. This makes it a good alternative for Sweet Pea tomatoes that may want relatively warmer areas. People who plant White Currant tomatoes like them due to how pretty they are once the fruits fully grow. It can be said to be similar to the Gold Rush tomatoes. White Currant fruits are not really used much alongside other fruits compared to their red Currant counterparts. Instead, they are mostly eaten raw due to their sweetness. Alternatively, they can be used to make jellies and jams. These tomatoes are indeterminate heirloom tomatoes as well. The fourth tomato seeds featured in this list, which are that of a Candyland tomato, are different from the previous ones. This is because the Candyland Tomatoes are F1 hybrid tomatoes and are not an heirloom. As for their specific characteristics, Candyland Currant tomatoes are of a red variety. The good news is that even though they are red, the fruits are still relatively sweet. Although the taste does resemble a regular tomato more than the yellow or white variety ones. The Candyland tomato plants are indeterminate plants. Fortunately, they can actually grow to maturity in just around 50-60 days. Furthermore, the growth pattern of the Candyland Currant tomatoes is less wild and more subdued. This makes them easier to care for. The last tomato seed variety in this list is the Sugar Plum Currant tomato. Like the Candyland Currant tomato, the Sugar Plum is also a hybrid tomato plant and is not an heirloom plant. Although the Sugar Plum tomato is listed last, by no means is it the worst among the group. It can be the opposite, in fact. Many gardeners claim that the red fruits of this tomato variety are the tastiest they have ever had. Additionally, being a hybrid tomato variety, the fruits tend to be more uniform. Hence, if one batch turns out great, chances are that you will have a bountiful year in terms of harvesting excellent-quality tomatoes. While the Candyland and Sweet Pea tomato varieties also bear red fruits. They are actually mostly pale red. Sugar Plum tomato fruits, on the other hand, are deeply red. This makes them look more elegant and pleasing to the eye. These indeterminate plants will require at least 65 days to mature. You have learned all of what you need to know about Currant tomatoes and the best Currant tomato seeds. Currant tomatoes are quite a great tomato variety. They bear tiny fruits, but each one of them contains shocking amounts of juiciness. Not only that, but they generally look gorgeous and appetizing. If you think you have what it takes to grow Currant tomatoes, buy some seeds and plant them in your garden!